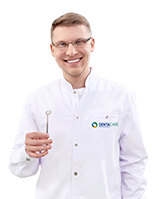 Receptionist at Denta Care. In her work she mostly enjoys direct contact with people. Her duties include supervising schedules and reminding patients of appointments. Her composure gives patients a sense of security, and provides a welcoming and friendly atmosphere.